Spend the night at the wildest place in town! Ever wondered what the zoo is like after hours? Our overnights put you and your group in the middle of the zoo at night where you will get to take a night hike, participate in fun, educational activities, get a peek at some of the zoo’s behind-the-scenes areas, and meet some of our animal ambassadors up close and personal! All three of our overnight programs (families, scouts/groups & adults) meet our educational goals: to foster a sense of wonder, share knowledge, and advocate active involvement with wildlife and wild places. Join the Zoo’s overnight program, Overnight Adventures, for special evenings designed for parents and children, age 5 and up. During the program, you will hike the Zoo, go behind the scenes, experience live animal encounters, and engage in other exciting activities. Awake to lion and gibbon calls, have breakfast, and then enjoy a special animal show. To get more information or to register for an overnight, please call the Education Department at (513) 559-7767. Children and Adults 5 years old and up. When are Family Nights available? Year round. See below for dates and topics. Family Overnight start at 6pm. Please arrive 15-20 minutes early. How much are Family programs? Where do Family programs take place? Twiga participants sleep in our brand new tented camp built on the edge of the Giraffe Ridge exhibit. Sleep with the Manatees participants sleep in the Manatees Springs building. Most other family overnights sleep in the Harold C. Schott Education Center. Sleep With The Manatees Did you know that The Cincinnati Zoo is one of only two institutions outside of Florida that rescue and rehabilitate manatees? Come experience a once-in-a-lifetime sleepover with these gentle giants! During the overnight you will enjoy two sneak peeks behind the scenes, hike the Zoo at night, play games, experience animal encounters and fall asleep with our resident manatee, swimming at your feet. Includes admission and parking to the zoo for the next day. For families with children 5 years old and up. 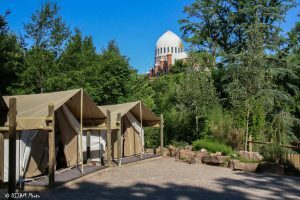 African Tented Camp Overnight Transport yourself to Africa during this brand new tented camp overnight experience at the Zoo! Built on the edge of the newly expanded Giraffe exhibit Twiga Tented Camp offers an intimate, high-end, authentic adventure at the Zoo including special encounters with African animals, behind the scenes tours, comfortable cots in safari tents, a continental breakfast and so much more. Includes admission and parking to the zoo for the next day. For families with children 5 years old and up.